It is time for another fun building challenge! This month my friend Katie at Addicted 2 DIY is hosting and she picked the Great Outdoors Challenge! 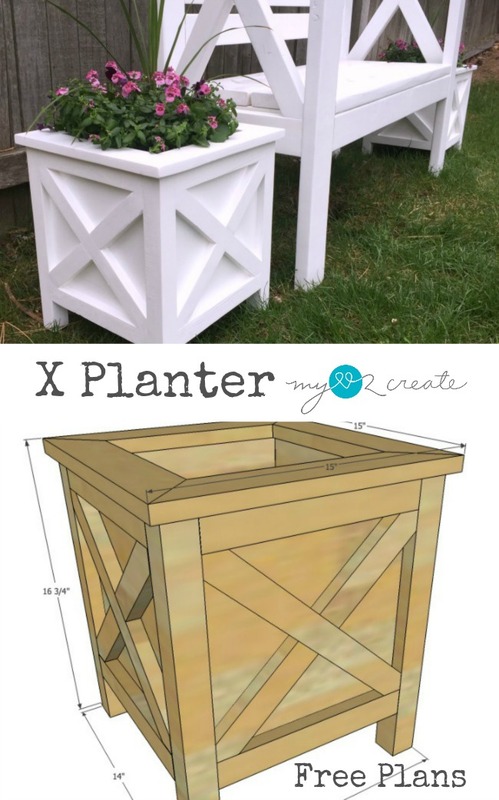 Basically any outdoor building project will work, so I am going to share my X Planter that I made to go with my X Arbor with Bench that I posted last week. Now my arbor isn't lonely anymore! 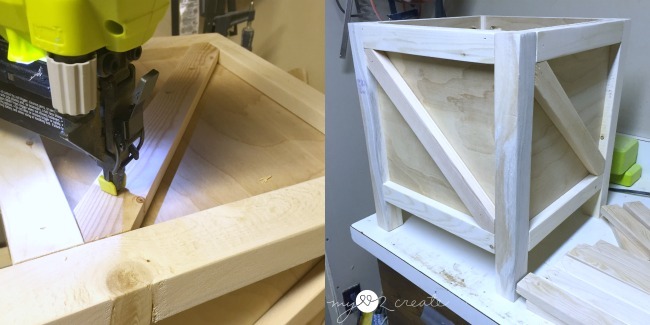 Click Here for the PDF X Planter Plans and be sure to read through my tutorial below as well, for more tips on the build. 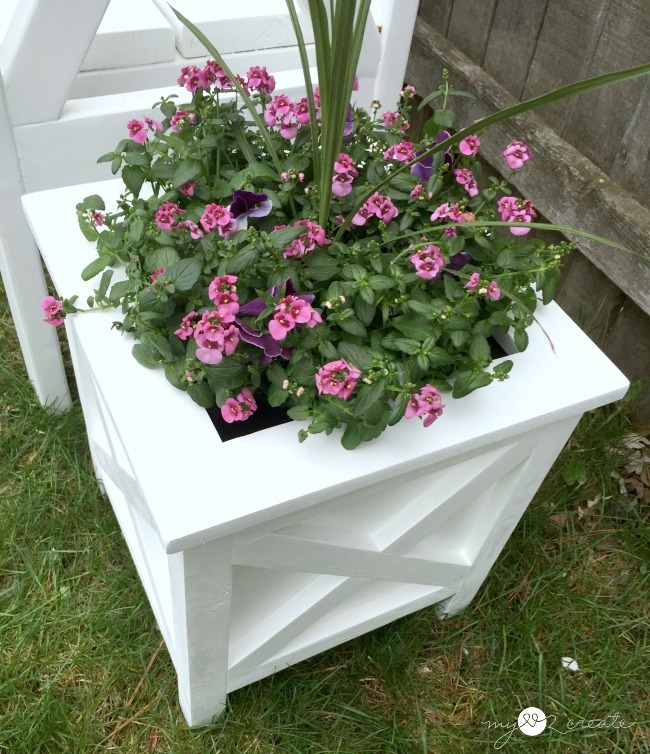 *FYI- I recommend using an exterior grade plywood that will ensure a longer life for your planters as the glue is made to withstand the elements. 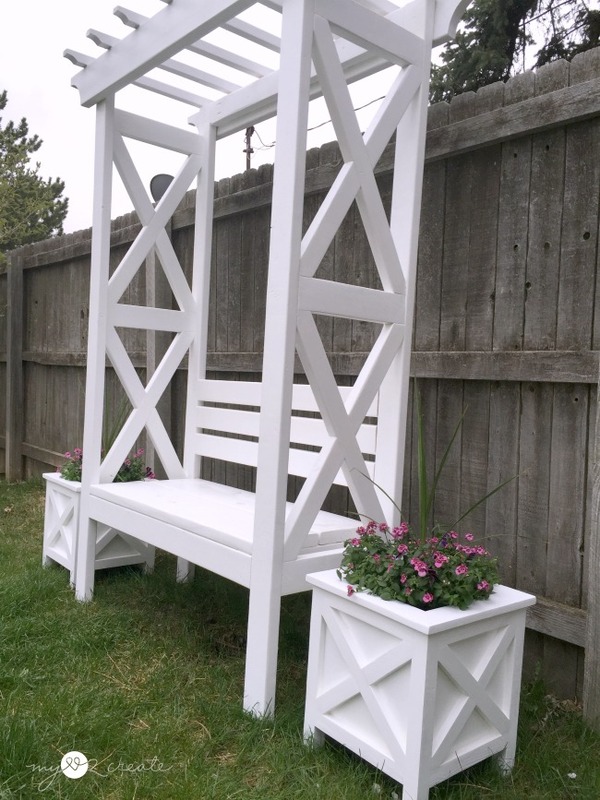 Another option is MDO, or medium density overlay, which is engineered plywood with a resin treated fiber applied to both faces, which creates a smooth finish and makes it great for the outdoor elements. I started by cutting my wood. I had some 1/2'' plywood left over from another project so I used it instead of 3/4'' plywood. 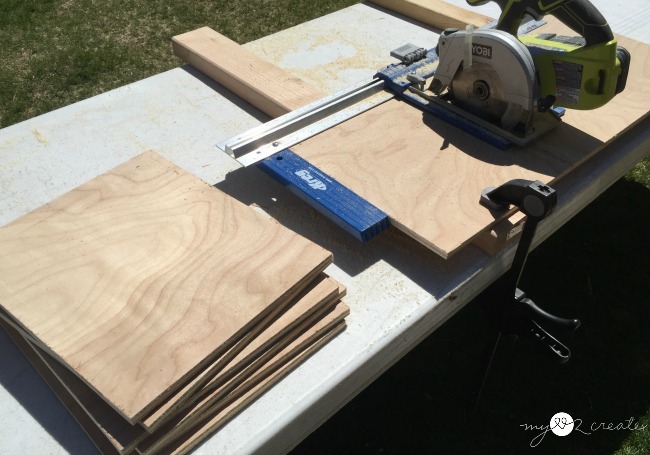 I used my Kreg Rip-Cut and Ryobi Circular Saw to cut my side boards. 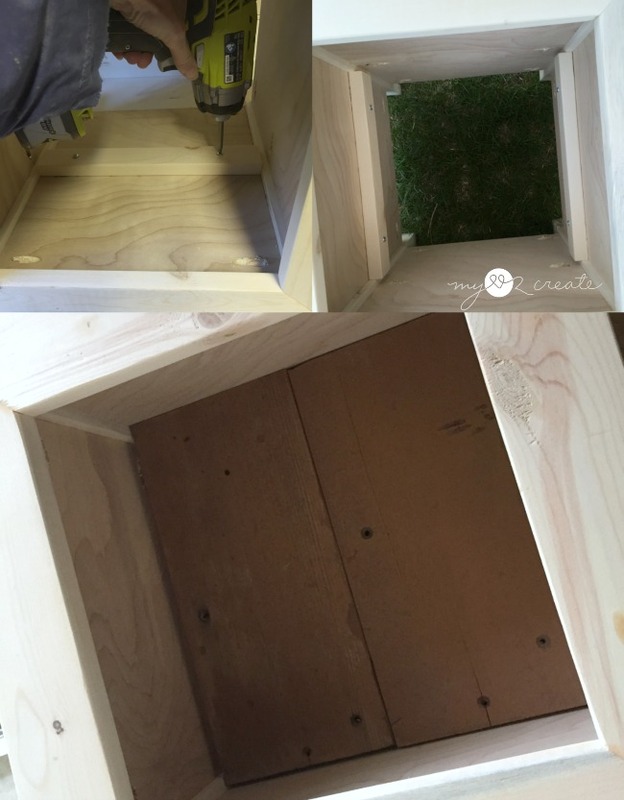 Then I drilled pocket holes in my plywood. 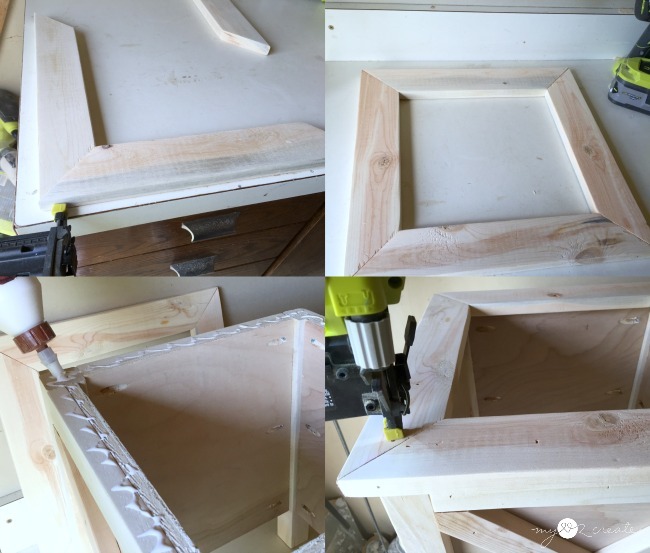 To build, I set the plywood on the 11'' 1x2 trim pieces and then attached the plywood to the legs with pocket hole screws and wood glue. 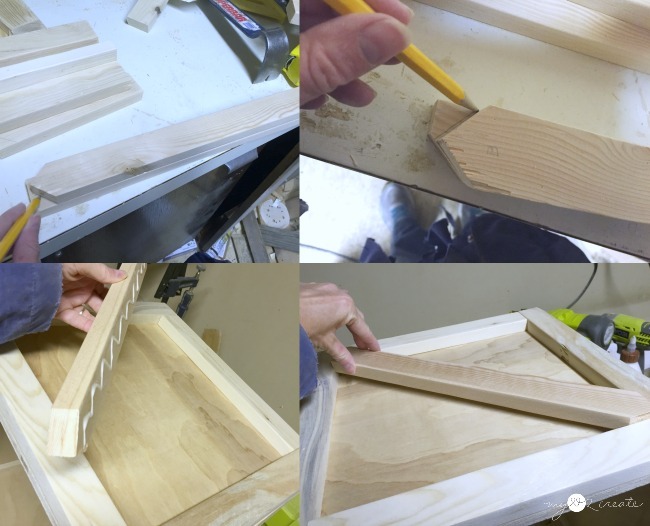 Then I attached the 1x2 trim pieces to the front of the plywood, you can do this step first before attaching the plywood to the legs, either way works. Once I had two sides done I added a third, and then the last side. Then I added the 1x2 trim, to the plywood sides (not pictured). For attaching the x pieces I cut the first board with the correct angles. Then I used it as my template for all the rest of the boards. In the top left I marked the board, then I cut my 42 degree angles. Then I flipped it over and used my template board to mark the other side (top right) and cut my 48 degree angles. The plans have all the details on what angles you need to cut where, I recommend marking your boards for what direction it will be placed on your planter, and mark front and back, trust me, it makes it easier. 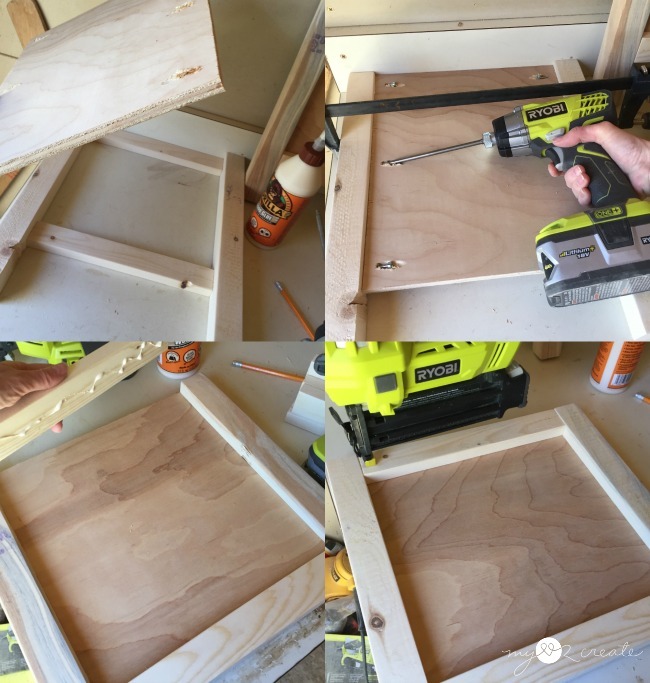 I glued and nailed the long x pieces into place with my Ryobi nail gun . Then I added the smaller x pieces. I used my template board for these as well. The "straight" edges that meet up with the long x piece, are actually cut at a 7 degree angle. For the top I decided it was easier to glue and nail the four 1x3 boards together first. I added glue to the mitered ends and nailed into each side with 2 inch nails. Then I added glue to the top of the planter and nailed on the top. 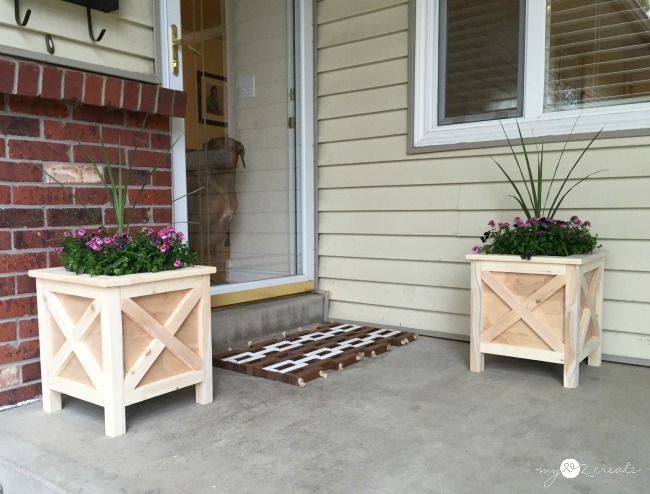 The 1x3 boards leave a 1/2'' over hang on the outside and inside of the planter. For building the bottom or shelf, you can put it where you need it. 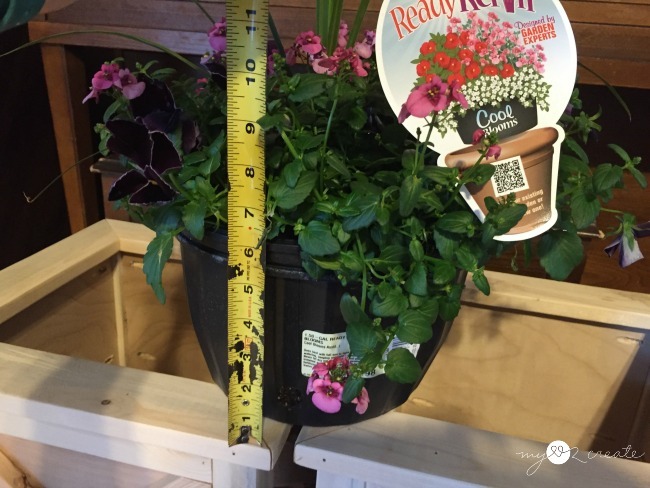 I wanted my planter to fit perfectly so I measured it for where to place my shelf supports. I screwed on the 1x2 shelf supports, and then added some scrap wood for my shelf. 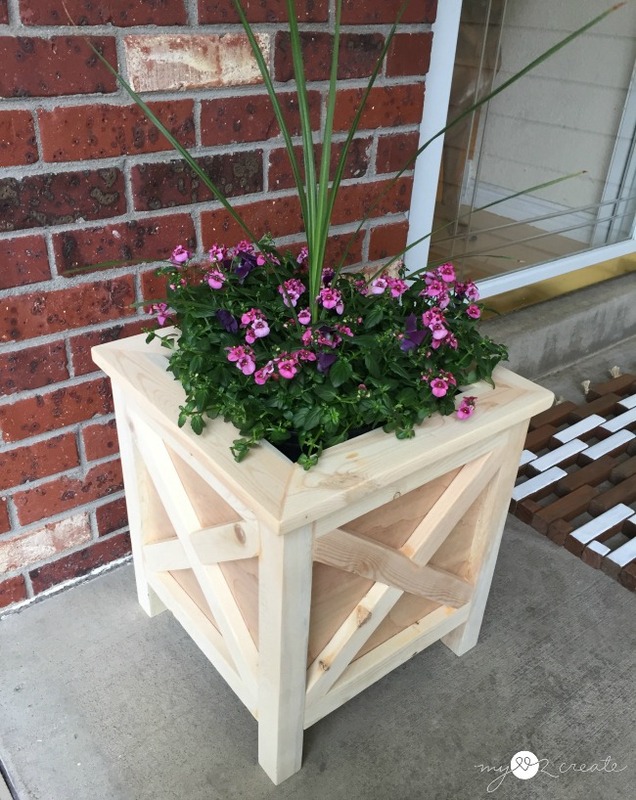 You could add dirt and plant you own plants or put in an actual planter like I did. That is all there is to it...except for finishing. I really really loved them natural. 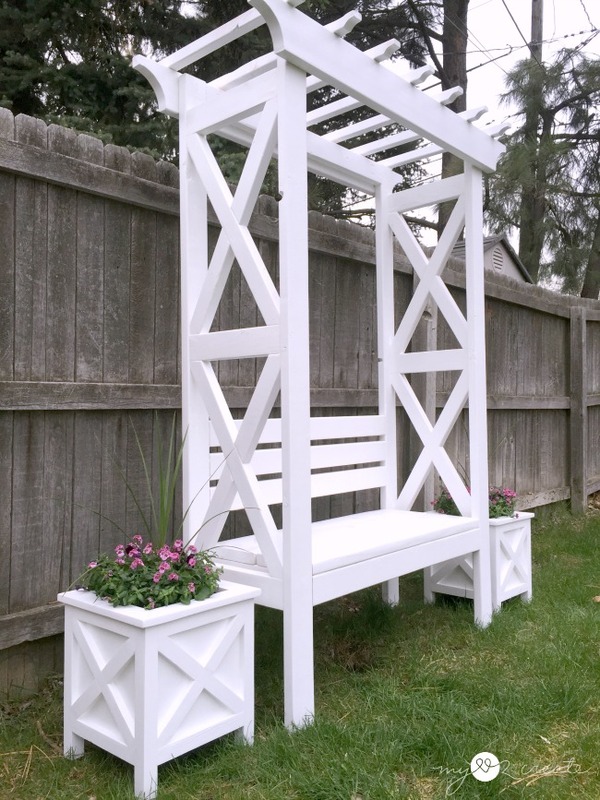 I wanted to stain them...but they had to match my arbor, which I also wanted to stain...but you can read about that in my arbor bench post. 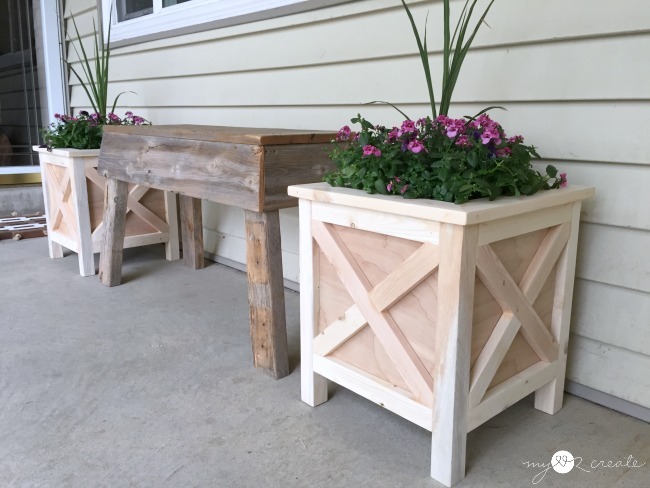 They are so perfect for a porch! 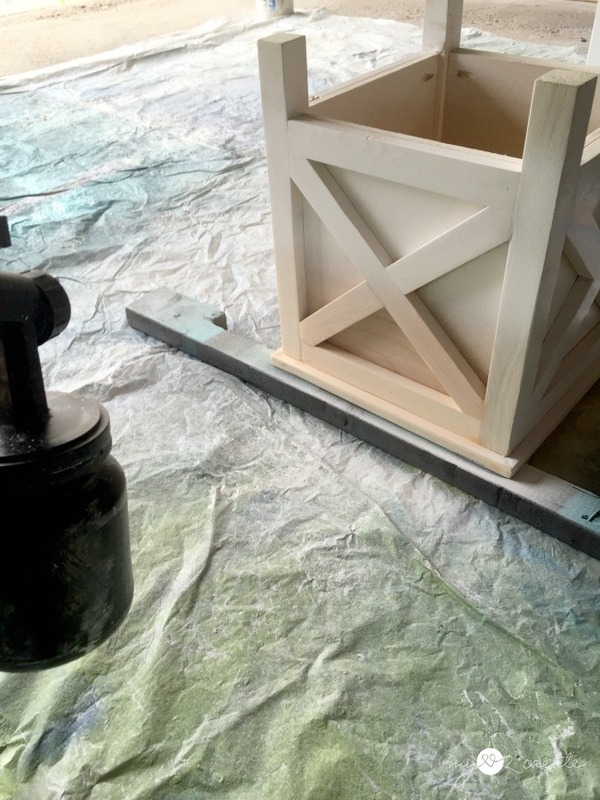 I did end up spraying them with my HomeRight Finish Max , I should have caulked the seams first, but thought I could get away without it...wrong. Paint shows everything, so after one coat of paint I caulked and then finished off with one more coat of paint. It made a huge difference. Even if I had to paint them, I still love how they look! They make my yard look pretty. And it looks like my grass needs cutting, spring really is here! Woo hoo! And now for the Great Outdoors Challenge!! Are you ready to rock this?!! 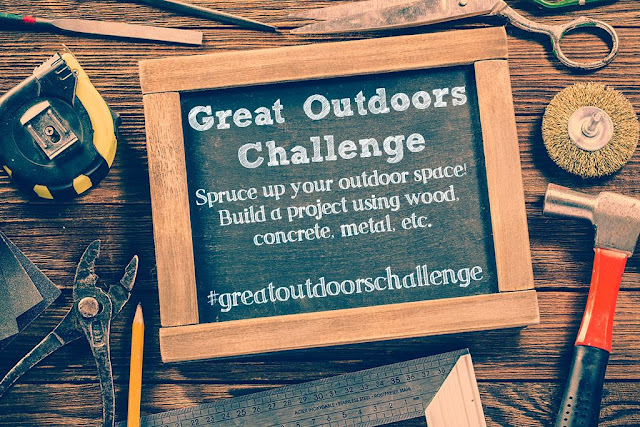 From my blogging friends that are sharing their outdoor projects today! Be sure to stop by! Have fun linking up! Don't forget to share so everyone can participate! Wow, Mindi! The planters are beautiful! Especially next to your stunning arbor bench! You are right, they can go just about anywhere and fit right in. 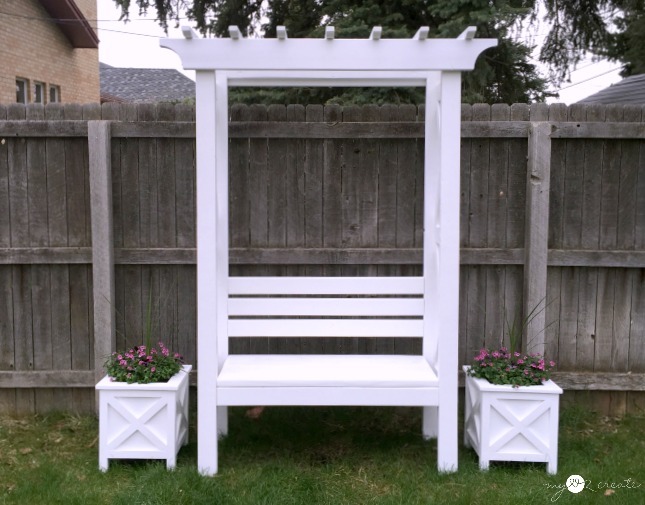 Those planters next to your arbor look like something straight out of a magazine! Seriously, great work! Love these planters. They looks really simple to make as well. Oh Mindi, you've outdone yourself with these planters...they are so cute! They look fantastic flanking your arbor. Had to catch up this morning on everything you've been up too, and as usual I love it all. I'm fighting the urge to look at planters though - I'll want some but don't have a green thumb. Love the planters! Thank you for sharing the plans with us at Brag About It! Pinned to share. Thanks for sharing at the Inspiration Spotlight party. I love your tutorial and project! Pinned for later. Every time I see something you make, my jaw drops. You are amazing. will the plywood hold up in the weather conditions outside? Hi Peter, that is a great question, and honestly the plywood I used is not best for outdoor use. My planters will probably not last as long because of it. However they have stood up great so far! I would recommend an exterior grade plywood or MDO ("MDO, or medium density overlay, it's engineered plywood with a resin treated fiber applied to both faces. This gives an extremely smooth finish that is easy to paint. In addition it's rated for exterior use, which means it is safe from the elements, insects, or other outdoor hazards, making it a perfect choice for the new deck or porch"). The glue in normal plywood is not exterior grade and will not hold up as long. Hopefully that helps, and I am glad you asked I will make sure to include this in the post!